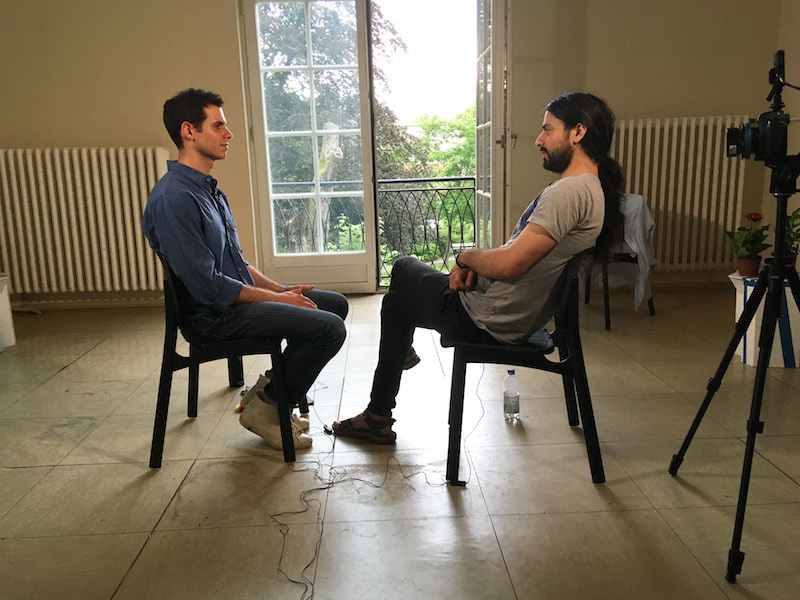 Ben Tumin (left) interviews a Syrian refugee named Muhannad. With his political comedy about the Syrian refugee crisis, Ben Tumin highlights the revolutionary nature of irreverence. 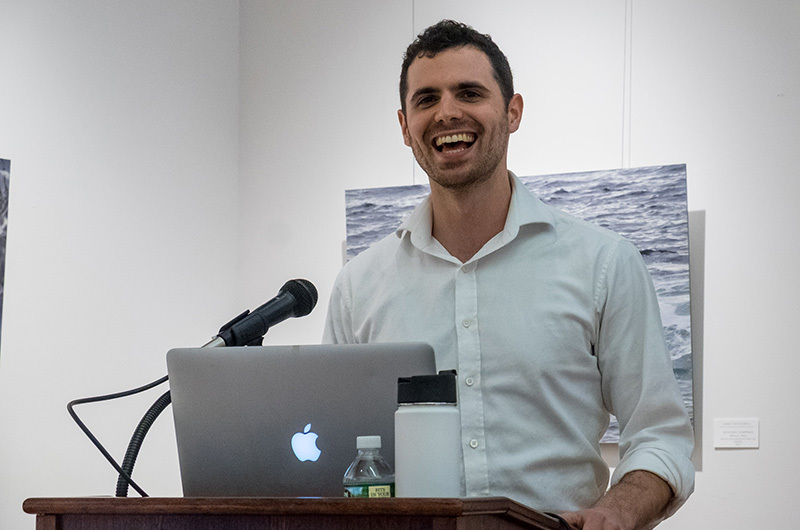 “Comedy is a tool, especially for issues that people are tired of hearing about,” Mr. Tumin said at his multimedia presentation Monsters to Destroy, performed Wednesday at the West Tisbury library. His piece focuses on refugees from the war in Syria and begins with a question: Do refugees threaten national security? Over the past 15 months, Mr. Tumin has taken a rigorous look at the question through filmed interviews with refugees and retired marine and refugee advocate Scott Cooper, with data from nonpartisan think tanks, and with stories from his own family history. He concludes that the answer unequivocally is no. In fact he argues that refugee resettlement in the U.S. is paramount to maintaining national security and international stability. Mr. Tumin, who has long family ties to the Island, is taking his message on tour, making more than a dozen stops around the country. The goal is to remind people to consider the plight of refugees, especially as the 2018 midterm elections approach. He has found his niche as a public speaker, filmmaker and comedian. His multimedia presentation marries personal reflection, statistics and data, documentary style interviews — and comedy. In filmed interviews with Syrian refugees in Berlin, his jokes about American reality television, cheeseburgers for breakfast and facial hair take both the audience and interview subjects by surprise. But the interviews don’t shy away from the gravity of the conflict. One young man from Damascus named Nafee describes arriving late to an appointment only to realize the area had been bombed minutes before. Nafee told Mr. Tumin he feared for his life being smuggled to the Turkish coast and then again trying to reach safety on a sinking raft. Mr. Tumin focuses on the years-long Syrian war and its victims exclusively for an hour. The United Nations estimates more than five million Syrians have fled the country and another six million are internally displaced. Mr. Tumin noted that 11 Syrian refugees have been allowed to enter the United States so far this year. In the presentation he provided data on popular opinion on refugee resettlement throughout American history. A 1939 Gallup poll found that 61 per cent of Americans were against the idea of resettling 10,000 German refugee children, most of them Jewish, in the United States. At the time many Americans expressed fears that Nazis would slip into the country disguised as Jewish refugees. Mr. Tumin said refugees contribute significantly to American society, tying in economic data and evidence from his own lineage. He shared the story of his grandfather Werner Klugman, who fled Germany in 1937 to escape the Holocaust. Mr. Klugman later joined the U.S. Army and served during World War II. “I’m using it to kind of flip it on its head with the implication being that the more we label the wrong people monsters, the more we become monsters ourselves,” Mr. Tumin said. After the presentation ended Wednesday evening, Judy Fisher of West Tisbury raised her hand to commend Mr. Tumin on a job well done. Mr. Tumin’s mother Margaret Klugman, who lives on the Island, sat in the front row for the presentation. She said it was moving to see her son talk about her father’s journey to the United States.